FROM THE STREETS. AcoustiHoo is Sue Orfield on tenor sax, along with Chippewa Valley residents Randy Sinz on upright bass, Lucas Fischer on guitar, and Olaf Lind on violin. Sue Orfield is it. The tenor sax player is one of the definitive jazz figures in the Chippewa Valley, and she has the credentials to back that statement up. Whether she’s playing with the Chippewa Valley Jazz Orchestra, the Butanes, or the Tiptons Sax Quartet, or if she’s fronting her own band, Orfield plays with a soulful intensity matched by few others. Always busy and frequently jetting across the Atlantic to spread her music, Orfield has still found time to record a new self-titled album with AcoustiHoo, a project that differs slightly from the rest. AcoustiHoo has been around since 2010, and is the direct result of Orfield’s desire to play in a more acoustic setting. 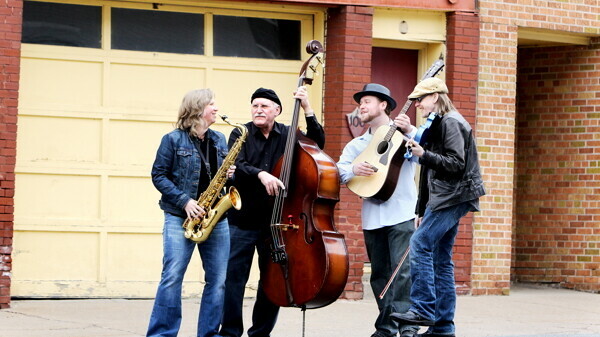 The band is a four-piece, made up of Orfield on tenor sax along with Chippewa Valley residents Lucas Fischer on guitar, Olaf Lind on violin, and Randy Sinz on upright bass. AcoustiHoo doesn’t conform to the jazz idiom, or any specific genre for that matter; instead, the project is an amalgamation of blues, gypsy jazz, and folk music, and the sound that comes out of that union varies from song to song. It’s clear, both through the band’s songs and its members’ sentiments, that this music completely transcends a particular genre. “Music is one of the most incredible things about humanity – we make noise just to hear it,” Lind says. “To artificially limit the experience through the strict imposition of genre seems to serve only to limit the possibility of experiencing music as it is.” There certainly aren’t any limitations present on this album. Orfield and Lind work in almost continuous tandem, the timbres of their respective instruments complementing each other nicely on melodic lines. Orfield breaks away frequently for solos, superimposing her blues sensibility over a folk setting. The album features compositions from all four members, along with a couple of traditional folk tunes and a fantastic rendition of an old jazz standard. If you’re itching to grab AcoustiHoo’s self-titled album the day it comes out, you’re in luck. The band is throwing a CD release party on April 19 at the Stones Throw in Eau Claire, and it’s going to be kind of a big deal. Local artists Steve Bateman, Brianna Capra, Dana Sterzinger, and Brian Duerkop will be turning the Stones Throw into an art gallery for the evening, and AcoustiHoo has also invited Lizzy Diane and Paul Lawrence to play some tunes. Doors open at 6pm with the music starting at 7pm. AcoustiHoo is also throwing a second CD release party, and it’s for a very good cause. The following week, on April 26, the band will be playing at Danzinger Vineyards & Winery in Alma in support of an organization called It Can Be Done Africa, a nonprofit movement dedicated to spreading knowledge on sustainability. The benefit/CD release party runs from 6pm to 9:30pm. For more info on the organization, go to www.itcanbedoneafrica.org, and be sure to check out www.acoustihoo.com and www.sueorfield.com and for tour dates and news.